Advantages for both the employer and the employee occurs when the employer allows flexible work schedule to the employees. Challenges may exist for both the employers and employees in terms of flexible work hours like compressing the work days and adjusting schedules. While working from home may not be considered as a better option for most of the employees, working in a flexible schedule can provide considerable benefits to the business. ‘Flexible working’ does not mean that the person is simply just working from home. Flexible working employees can work from anywhere, from home, from cafes, or during their commute. Flexible work schedule enables the employees to make use of the audio and video conferencing resources with the internet and mobile services and provides assurance to the employer to get the job done even if the employee is not physically present. Working less than normal hours, less days in a week and less weeks in a month. Also called as flextime or flex hours. The working hours are scheduled by the employer and the employee can come in and go during work hours as they please. The number of hours they work is taken in terms of a whole year, instead of taking the number of hours per week or a month. 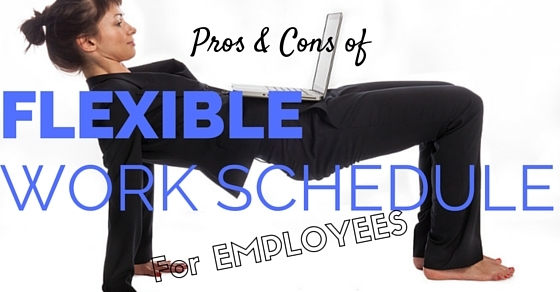 Employees are expected to work for a certain amount of hours for a year, but the hours are flexible when they work. Employees are expected to work and do their jobs for a certain time period and the employee compresses the number of working days but still satisfies the hours of work spent. Different starting times, break and finishing times for different types of employees. Sharing a job suitable for a single person with another individual. Telecommunicating, working from home, the physical presence of the individual is not required. Flexible work schedule allows the employees to meet the family needs, personal obligations and life responsibilities efficiently. If you have a flexible work schedule you can be able to meet the day to day errands and take care of family members without any interference in work. Flexible work schedule reduced fuel consumption by the employer and less wastage of time by commuting and traveling from home to workplace and vice versa. In many cases, employees usually have to travel a lot for commuting to and fro from their homes to their workplaces. This means the employee feels more fatigued and stressed after a day’s work. Working from home solves that problem and hence the employee does not have to face the challenges caused by commuting in public or private transport. This can be beneficial for employees who have certain health problems such as lung diseases or cardiac issues. A huge amount of satisfaction can be given to the employees when they have personal control over their work hours. This is the one reason that many people like to work for themselves. Control issue can be taken in a positive sense by the employee. By allowing employees to take control and schedule their own work schedule and work environment, they are motivating the entrepreneurial behaviour which can be encouraging for the employee. As mentioned before, flexible work hours provide enhanced job control. When the amount of job control increases this leads to a reduction of workplace related stress. Hence, no unwanted disagreement between co-workers can take place. The employee decides what and how they will do the work given by the employer. Flexible working hours are proved to provide employees more satisfaction in work and makes the employees happier than their fixed working counterparts. Employees who decide their hours of arrival and departure to work are more relaxed. This increases the morale within the employee. This is beneficial for companies where they are trying to cut the costs and combat the forces of the economy. Flexible working requires less cost than fixed working hours since less arrangements and functions have to be made and set up. This can be a great cost cutting tactic followed by small companies. Absenteeism and reduction in employee turnovers have reduced by a factor of 25% through flexible working hours. Here the employees can carry on with their errands and other arrangements and still make it to the office. Hence, the employee does not have to be burdened by rescheduling prior commitments and juggle work along with their own personal lives. This makes the employee more relaxed and can provide more output for the company. By introducing flexible working hours many companies can still be able to have their old employees without any hitches. This is because the employees feel more comfortable in working in an environment having adaptable and flexible working hours than be strictly following a regiment set by the company. This makes the employees happier and be more interested in work. Hence, less number of employees leave or change their present companies. Flexible working hours is the key factor of keeping hired employees to the company. As employees can cope with the hectic schedule of the office by creating their own version of the timetable that meets the working conditions of the office. This reduces the need for doing overtime by the employee. Flexible working environments reduces the amount of work pending by the employees as compared to their fixed schedule counterparts. It has been found out that people who work by following a flexible working schedule has had their productivity being increased by 1% to 5%. The relationship between the management and the workers have also been improved, and employees do not want to go back to fixed working hours. Flexible working has also demolished the age old practice of face management. Face management is the process where the supervisor has to see the employee do the work just to make sure the worker has completed the job. This can cause discomfort for the employee and he/she may not be comfortable about it. If such age old practices are followed, employees have to stay late just to impress the boss. In modern working environment, employees can resent such an approach, since comparison of how much time they spent for work is not necessary for the task to be completed. Moreover, employees tend to join companies which offer flexitime benefits since it is more relaxing. Communication between various employees is also improved since they know all will be present during peak periods of work. Flexible work schedule can increase staff concentration. It is usually difficult for the staff to concentrate on work in a busy office, but flexible working hours provide the employees to choose the comfortable time and place to work. For example at home or a park or a café. Hence it creates a soothing and a peaceful environment for the employee to enjoy and do work. Uneven workloads can be identified by the company. Uneven workload is defined as the number of hours that the employee spends for work. This provides alterations to be made and even support promotions. Flexible working hours have proven to be beneficial for meeting and conferencing with customers or clients that are abroad or at varying time zones since there is no restriction for time and space for the employee. The employee can easily attend a conference with the clients in the comfort of his house and such meetings are not only just confined to the conference halls of the company. 1. Flexible work hours are not suitable for employees who thrive in an office environment and do not share the same schedules as their colleagues. They usually do not take the initiative or take the decision to do work based on their work schedule. Some people do not find working at their own pace comfortable. 2. Some people take advantage of flexible work hours as an invitation for work from home and relax. This means playing and having fun while doing work at the same time. This can disturb the concentration of the employee while doing their jobs and can cause errors. 3. Some managers who follow the face management routine, that is, watching their employees work all day long and then watch them leave for home, cannot cope up with the sudden change in the work culture. This requires a lot of faith within the employer for the employee. Hence, such a relationship is based solely on trust, since the manager is not seeing how much work their employees are doing everyday. 4. Office-oriented and fixed schedule workers often view their flexible working colleagues as slackers and lazy since they cannot see their work and their productivity. This can cause disagreement up to a certain extent among the two groups. 5. Working from home gives a wrong idea within the society that you are not working. This can cause a misunderstanding with you and your relatives, neighbors or friends. Try to make them clear about the kind of job that you do and explain to them what flexible working is. 6. There is no clear definition between work and home. When you adjust your working schedule, your supervisors and managers can also do the same. That means if you adjust your working time for a personal event, your boss will not feel guilty in calling you late at night to discuss about work. Flexible working conditions works for both parties. Managers and supervisors are also employees of the company so they can also follow adaptable working hours. 7. This type of working habit is a huge disadvantage in team oriented environments where timely conferences and meetings are required to discuss about future projects and various other developments. 8. Compressed working hours conditions may not give a good impression to the employees from a third person point of view. Clients who are unaware of such a culture, when seeing that the employee is not present will give a bad impression about the employee and the company. Clients expect workers to be present five days a week during peak working hours and they become angry when the employee is not present on a certain day. 9. Compressed work schedule can have mixed reactions within the employees. Either they can improve staying at home and be more productive or they can slack off and can increase the amount of work incomplete and pending. 10. Compressed schedules can also cause unwanted amount of stress within the employees. This is because employees work hard and do overtime so that they can get the rest of the days free. This can cause a rushed and an unsatisfactory output for the company. Ultimately, a flexible working environment is to be designed in such a way that it should cater to the company needs and practices. This provides benefits to the company in terms of strategic workforce planning and implementation. This method of employment is also a good method to attract young employees and competent individuals to join the company. This can reduce the amount of workforce shortages in many parts of the world. By integrating the knowledge and the expertise of the older employees and higher ups, a flexible employment agreement can be designed which can be beneficial to the company in the present and in the future. Employing a flexible work schedule can actually make the younger generation more interested in working and can also provide them enough time so that they can try to venture out for other activities such as sports, music etc. Flexible work schedules can also act as the perfect time to introduce new and improved strategies within the company. Also Flexible work schedules can encourage a friendly nature between employees from the bottom level to the top most level of the company.